Anyone who uses a natural gas heating system will appreciate the delightful Bellageo Blaze. Part of the respected Crystal Fires brand, this open-fronted gas fire generates 1.4kw to 5kw of heat reliably within its vicinity. It functions compatibly with most conventional chimney flues, including both slimline pre-cast flues, and medium depth and full depth models. This item carries a solid 5 year warranty. The Bellageo Blaze offers customers the option of selecting either pebbles or coals for use in the fuel bed. It supplies two different trim options, too: Chrome or Brass. The unit features standard manual controls, and for an additional amount purchasers can obtain a convenient remote control unit. The beauty and warmth of the lovely Bellageo Blaze provide a welcome addition to homes and businesses in the United Kingdom, and around the world. This well-manufactured product relies upon very high quality materials in its construction. It will mesh well with virtually any residential or office décor style, including conventional, vintage, and ultra-modern themes. This product offers convenience and comfort as a building improvement. Yet it also makes an ideal gift for a special occasion! 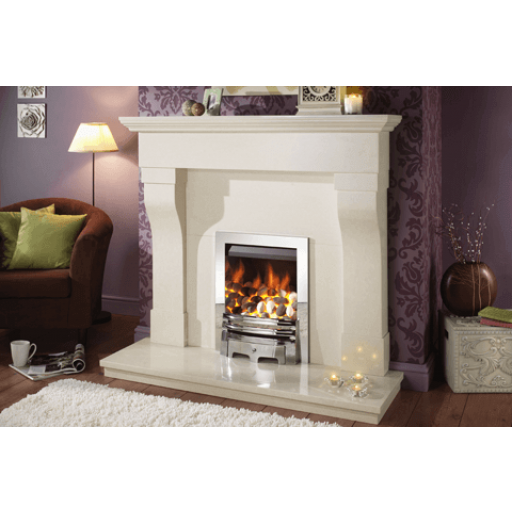 See the lovely Bellageo Blaze soon at your nearest Fireplace Warehouse store.